For the train operating company, see Midland Mainline. The Midland Main Line is a main railway line in the United Kingdom, part of the British railway system. The line links London (St Pancras) to Sheffield (Midland station) in northern England and connects other places including Luton, Bedford, Kettering, Leicester, Derby and Nottingham. There are plans to build East Midlands Parkway to serve East Midlands Airport. Express passenger services on the line are operated by the Midland Mainline train operating company. The section between St Pancras and Bedford is electrified and is also used by Thameslink commuter trains (operated by First Capital Connect), who also provide a through service from Bedford to Brighton. The northern part of the route between Derby and Sheffield is shared with Virgin Cross-Country train services. Central Trains also operates regional and local services between Nottingham and Leicester / Derby / Sheffield. The Midland Main Line was built in stages between the 1830s and the 1860s, as three lines which met at the Tri Junct Station in Derby. First to arrive was the line built by the Birmingham and Derby Junction Railway and its subsidiary the Stonebridge Railway from Hampton-in-Arden, Warwickshire, on the London and Birmingham Railway, to Derby. This section opened on 12 August, 1839. This is now the "cross-country" route through Birmingham to Bristol. This was followed on 1 July, 1840 by the North Midland Railway, which ran from Derby to Leeds Hunslet Lane Station via Chesterfield, Swinton, Masborough, near Rotherham (from where the Sheffield and Rotherham Railway ran a branch to Sheffield Wicker Station), and Normanton. This avoided Sheffield, Barnsley, and Wakefield in order to reduce gradients. On the same day the Midland Counties Railway, which ran from Derby and Nottingham to Leicester, was extended from Leicester (its previous Campbell Street Station being replaced by the current London Road Station) to a temporary station on the northern outskirts of Rugby. A few months later, the Rugby viaduct was finished and the Midland Counties Railway reached the London and Birmingham's Rugby Station. This cut 11 miles off the former route via Hampton-in-Arden. Consequently the Stonebridge Railway lost all importance, was soon singled, and closed in 1917 as a wartime economy measure and to release track material for other use. Thus this became the first main line in Britain to close. Its parent company, the Birmingham and Derby Junction, survived, reached Birmingham Lawley Street Station in 1842, and is now part of the Cross-Country InterCity route from Birmingham to the North-East. When these three companies merged to form the Midland Railway on 10 May 1844, the Midland did not have its own route to London, and relied upon a junction at Rugby with the London and Birmingham's line (which became part of the London and North Western Railway on 1 January, 1846) to London Euston for access to the capital. By the 1850s the junction at Rugby had become severely congested, and so the Midland Railway constructed a route from Leicester to Hitchin on the Great Northern Railway, via Bedford. The line avoids Northampton, a major town south of Leicester, instead going via Kettering and Wellingborough in the east of Northamptonshire. This line met with similar problems at Hitchin as the former alignment had at Rugby, so in 1868 a line was opened from Bedford via Luton to London St Pancras. The final stretch of what is considered to be the modern Midland Main Line was a short cut-off from Chesterfield through Sheffield, which opened in 1870. Also part of the line is the Erewash Valley Line, which carries services from Chesterfield and the north to Nottingham and the south. In the 1980s the line was electrified as far North as Bedford. The introduction of the High Speed Train HST around this time also brought about an increase of the linespeed from 90mph to 110mph. The cities, towns and villages served by the MML are listed below. Those in bold are served by fast InterCity services. Midland Main Line at Luton Airport Parkway. Rejoins with Erewash Valley line. The line was once the Midland Railway's route from London St Pancras to Manchester, branching at Belper Junction along the Manchester, Buxton, Matlock and Midlands Junction Railway, now known as the Derwent Valley Line. In days gone by, it featured named expresses such as The Palatine and the Peaks. Much later in the twentieth century, it carried the Midland Pullman. This line was closed in the 1960s between Matlock and Buxton, severing an important link between Manchester and the East Midlands, which has never been satisfactorily replaced by any mode of transport. A section of the route remains in the hands of the Peak Rail preservation group, operating between Matlock and Rowsley to the north. This is no longer considered part of the Midland Main Line: see Settle-Carlisle Railway. World War I prevented the Midland Railway from finishing its direct route (avoiding reversal at Leeds) to join the Settle and Carlisle. The first part of the Midlands West Riding extension from the main line at Royston (Yorks) to Dewsbury was opened before the war. However the second part of the extension was not completed. This involved a viaduct at Dewsbury over the River Calder, a tunnel under Dewsbury Moor and a new approach railway into Bradford from the south at a lower level than the existing railway (a good part of which was to be in tunnel) leading into Bradford Midland (or Bradford Forster Square) station. 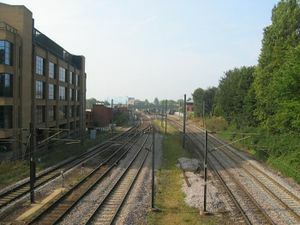 The 500yd gap between the stations at Bradford continues to exist today - closing it today would also need to take into account the different levels between the two Bradford stations, a task made easier in the days of electric rather than steam traction, allowing for steeper gradients than possible at the time of the Midlands proposed extension. The failure to complete this section ended the Midland's hopes of being a serious competitor on routes to Scotland and finally put beyond all doubt that Leeds, not Bradford, would be the West Riding's principal town. Midland trains to Scotland continue onwards from Carlisle via either the Glasgow and South Western or Waverley route. In days gone by the line enjoyed named expresses such as the Thames-Clyde Express and The Waverley. Here is the Worth Valley Branch junction to Oxenhope. The branch is now the Keighley and Worth Valley Railway heritage line. Settle Junction - here the line for Carlisle, opened for freight 1875, passengers 1 May 1876, continues. Heysham Harbour, including a station for Middleton Road Heysham. Garsdale - originally named Hawes Junction & Garsdale. Carlisle: the station - full title Carlisle Citadel was owned jointly by the LNWR and the Caledonian Railway: the Midland (among others) was a "tenant Company". The principal operator is Midland Mainline. First Capital Connect between Bedford and St. Albans. Central Trains between Leicester and Nottingham, and Chesterfield to Sheffield. Virgin Cross Country between Derby and Leeds, and Derby and Burton on Trent. Northern Rail between Sheffield and Barnsley, and Doncaster to York. GNER between Doncaster and Leeds. This page was last edited on 16 February 2007, at 01:42.